Biographical Research and practices as part of human understanding helps people to make sense of what has been and what is happening in their lives, cultures, communities and societies. Rooted in a long history and genealogy, biographical/narrative approaches have developed from a focus upon a single story, a ‘life story’, to encompass autobiographical secondary and archival research and analysis – as well as multi-media and arts based multi-sensory methods. The mid-term conference 2014 will examine the Theoretical and Methodological underpinnings of Biographical Sociology and the Creative Applications of Biographical Research. Questions such as what constitutes Biographical Research? What theoretical antecedents influence our work? How do we conduct Biographical Research? How might we apply Biographical Research? What Creative Applications are currently being practiced by Biographical Researchers? How are a new generation of Biographical researchers using biographical methods in their M.A and PhD research? It is almost three decades since Ken Plummer’s Documents of Life and his statement that “a major theme haunts this book. It is a longing for social science to take more seriously its humanistic foundations and to foster styles of thinking that encourage the creative, interpretive story telling of lives…”(The Documents of Life 2, p.1). The interim conference aims to do just that – to theorise, apply and encourage the theoretical, creative, interpretive story telling of lives. Papers are welcome on a range of topics including: feminisms, gender, sexualities, crime, violence, politics, the body, sport, health and well-being, youth and communities. Professor Kaja Kazmierska, Institute of Sociology, University of Lodz. Adapted from the book by Mike Alfreds & Jane Arnfield. Abstracts: We invite colleagues from different countries and different disciplines of the social sciences to submit abstracts of not more than 300 words until 19th May 2014. Expressions of interest for research workshops are welcome, with reference to the topic of the conference. Poster presentations and other forms of presentation are also welcome. Registration/College Accommodation: Registration will be available from May 2014 and up to July 30th 2014. Durham is a very beautiful city. The author Bill Bryson, who was Chancellor of Durham University, described Durham as: “A huge amount of history, a huge amount of beauty, and a great deal of friendliness”. Durham City is a World Heritage Site – Durham World Heritage Site was inscribed by UNESCO in 1986 (among the first UK sites to be listed) in recognition of its Outstanding Universal Value. Durham Cathedral, built between 1093 and 1133, is one of the finest examples of Norman architecture in Europe. Durham Castle was commissioned by William the Conqueror in 1072 and over the centuries has been the residence of the Bishops of Durham. The Castle was given to Durham University by Bishop Van Mildert in 1832 and is now a College. Should you sacrifice one man to save five? Whatever your answer, it should not depend on whether you were asked the question in your native language or a foreign tongue so long as you understood the problem. And yet here we report evidence that people using a foreign language make substantially more utilitarian decisions when faced with such moral dilemmas. We argue that this stems from the reduced emotional response elicited by the foreign language, consequently reducing the impact of intuitive emotional concerns. In general, we suggest that the increased psychological distance of using a foreign language induces utilitarianism. This shows that moral judgments can be heavily affected by an orthogonal property to moral principles, and importantly, one that is relevant to hundreds of millions of individuals on a daily basis. There are engough reasons to think this book has earned a spot among the classic ones. Some analysts even see it as renowed as the Marx´s Capital or Adam Smith´s Wealth of Nations. “El primer requisito de la política es la honradez intelectual, porque a la larga no hay mejor lenguaje que la verdad de lo que las cosas son”. En otras palabras, la honradez intelectual vendría a ser la búsqueda ineludible de la verdad, que en el plano político y social se traduciría en una justa interpretación de la historia y del presente. “Spurious correlations” is the name of a website I came across recently. There you can see plenty of cases where correlation may not imply causation. What does it mean in terms of research methods in the social sciences? It means that whenever our research approach is uniquely quantitative, we take the risk of come up with wrong or non-consistent findings. In other words, a certain doses of qualitative interpretation is always required in order to avoid wrong and sometimes ridiculous depictions of the social reality, like in the bellow example. It is true that advance and multivariable analysis allow having a more accurate understanding of certain social phenomena nowadays. However such analysis should always be preceded by a good interpretation of such phenomenon. What does “good” mean? Well, first of all take into consideration whether two or more variable are susceptible to be part of the same social reality. 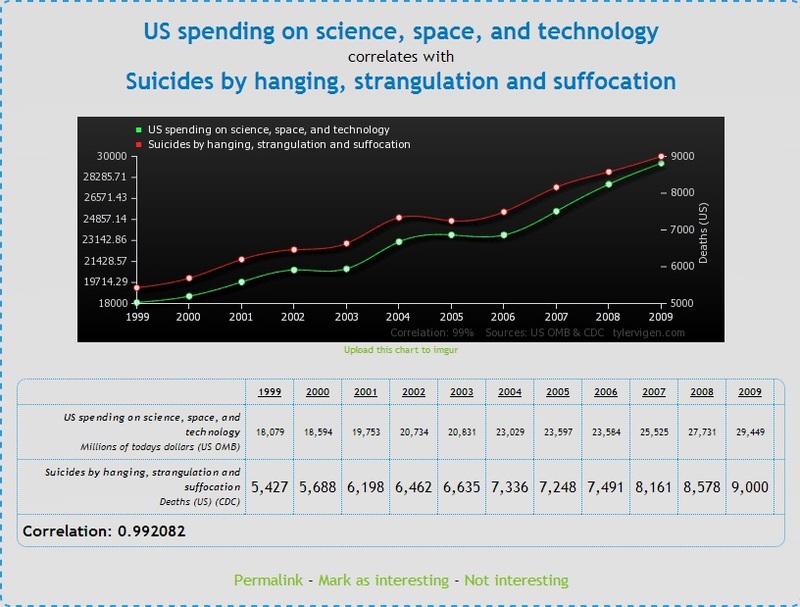 It doesn’t seem that “US spending on science, space, and technology” and “Suicides by hanging, strangulation and suffocation” has anything to do one each other. Secondly, even when two variables may potentially explain certain realities we should try to include more than one explicative variable. For instance, when studying the reality of Polish labor market, we may find correlation between education and employment. However, an accurate analysis should also include such other variables as age, income or social class. Such analysis are possible via the so called multivariate statistical analysis to be hopefully covered in future posts. The key of this sort of analysis is considering the right variables. To do so, we can use previous theories, where certain authors (based on previous empirical studies) suggest a number of a priori relevant and explicative variables.